Do you change your ELEMENT / FILTER periodically? Your ELEMENT / FILTERS will shorten the life of the machine unless you replace it within the recommended time. 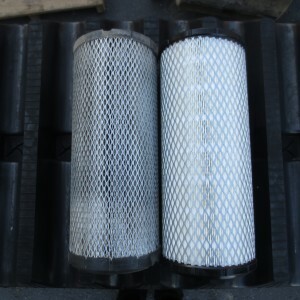 Filters are used to prevent trouble caused when impurities in the oil, fuel, or air enter important equipment. When the replacement interval listed is reached, always replace or clean the filters. However, when using this machine under heavy-duty conditions, you should replace the filters before the specified replacement interval has passed. AIR FILTER: Should be changed after one year and cleaned 3~4 times a year if the machine is used often. ※This is only after the first 100 or 50 hours for new machines. Please contact to the distributor of your area about the machines and products above using the link below. ＊Please fill in the contact form if you can’t find a distributor your area. Please input the letters shown above. Copyright ©Morooka Co.,Ltd. All rights reserved.